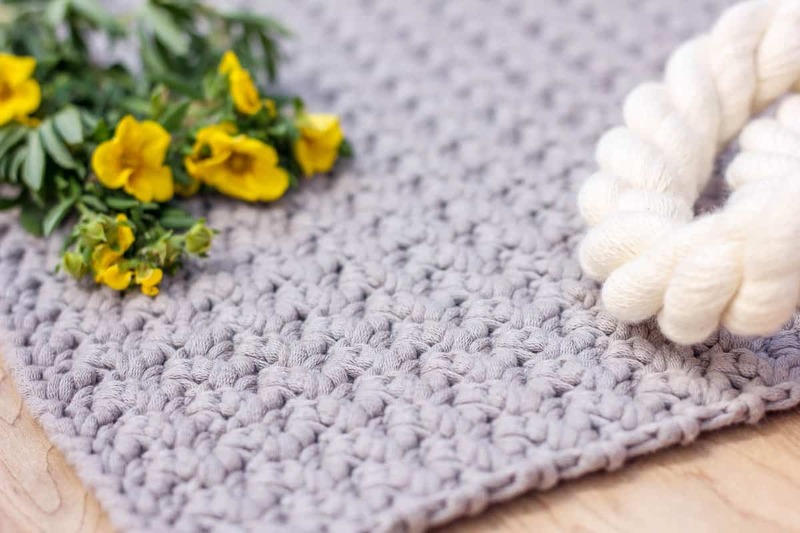 Requiring only single and double crochet and a very simple construction, this free crochet bag pattern is perfect for beginners. 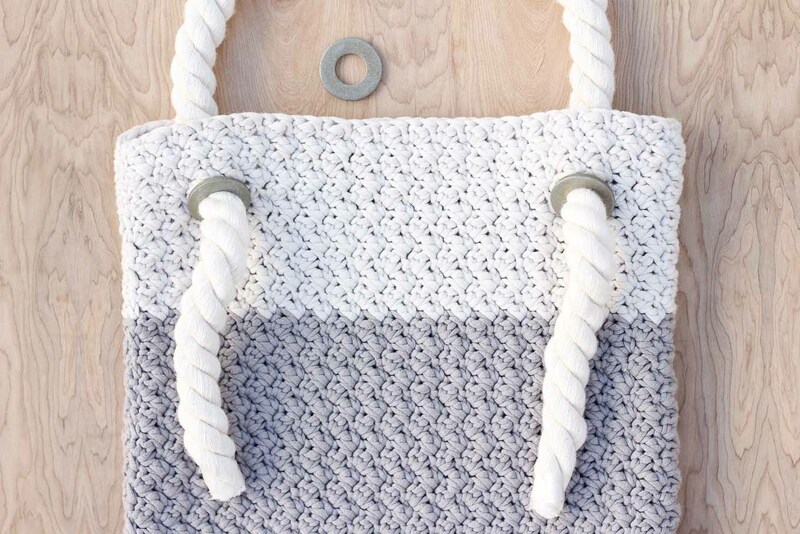 Neutral colors and a beautiful texture combine to form the perfect modern tote. 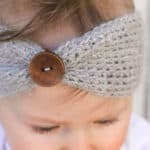 Calling all beginning crocheters! (Or more intermediate crocheters who like to zone out and watch Netflix while you’re hands mindlessly make something beautiful!) This tutorial is for you! 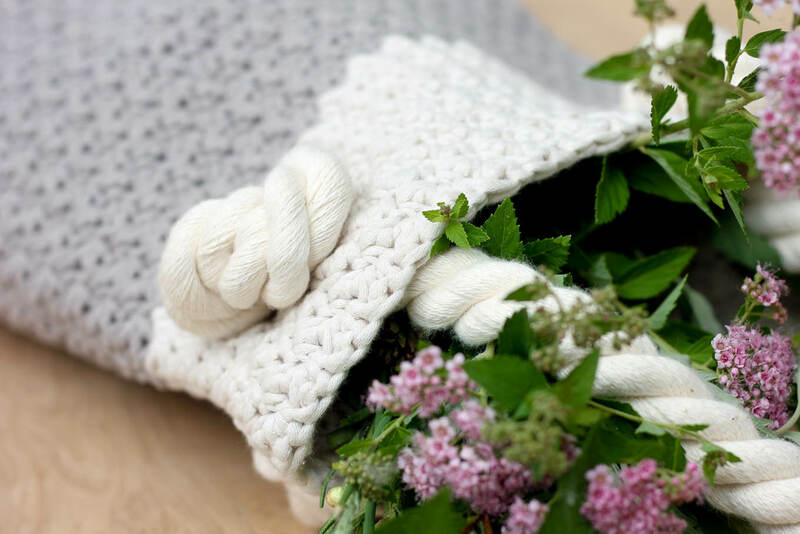 Even though the resulting texture of this stitch is gorgeous, the only skills you need to know to crochet this bag is how to single and double crochet and how to crochet a rectangle. 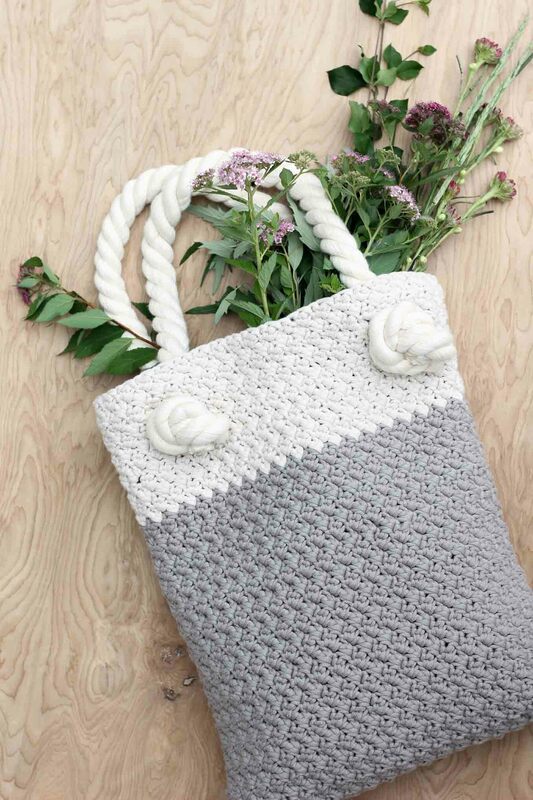 Let’s be honest, this tote bag is not a whole lot different from a really lovely giant crocheted washcloth sewn in half. Which is awesome because speaking of sewing in half, the construction of this bag is super simple. 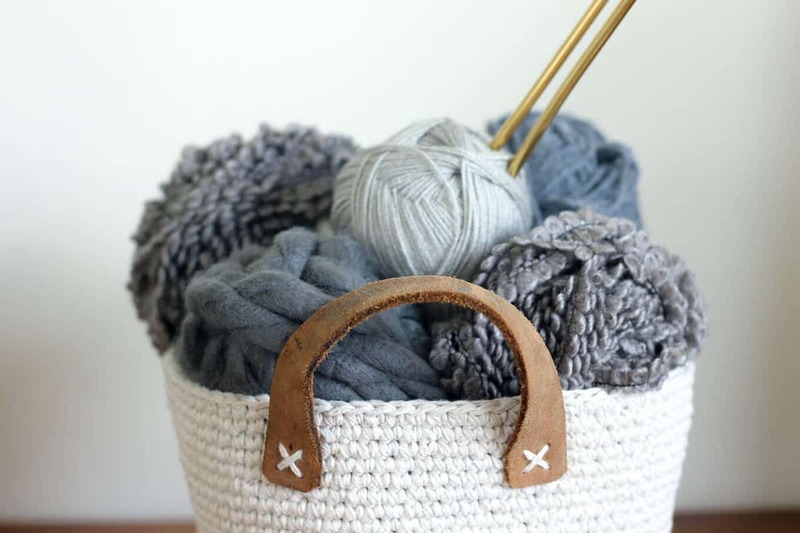 Like, you don’t have to have any crochet bag experience, crochet joining experience or really any other sort of experience to put it together. Just fold it and sew it. Have you queued up a movie yet? Because you have some wonderfully mindless, yet satisfying crocheting ahead of you. 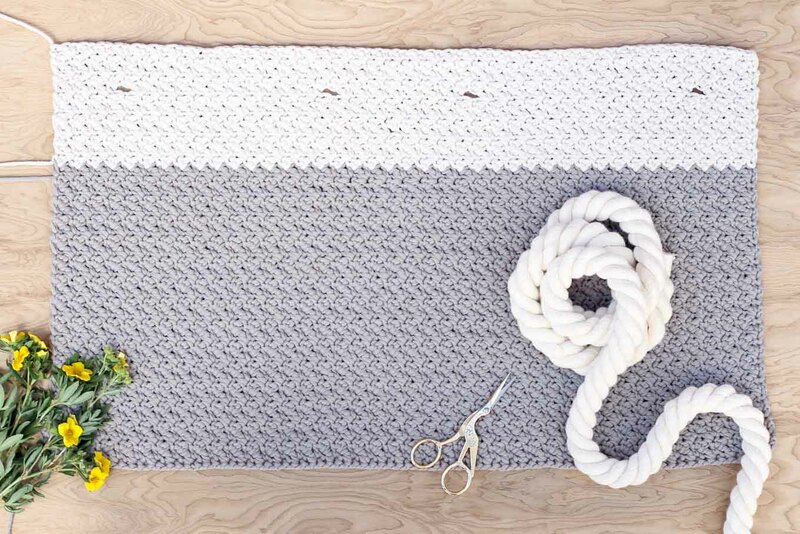 To work a gauge swatch in Suzette stitch, make a multiple of 2 ch for the foundation chain. 18 ch will be sufficient. Work rows 1 and 2 of the pattern, then repeat row 2 until the swatch measures approximately 5” high. If you’d like, save this swatch and sew it inside your bag as a convenient pocket. Watch the Suzette stitch video tutorial if you prefer video learning! Row 1: (1 sc, 1 dc) into second st from hook, *skip next st, (1 sc, 1 dc) into next st; repeat from * to last st, 1 sc in last st; turn. Row 2: ch 1, (1 sc, 1 dc) into first sc, sk next dc, *(1 sc, 1 dc) into next sc, sk next dc; repeat from * to end finishing with 1 sc in turning ch; turn. Repeat Row 2 to form the stitch pattern and continue until work measures 11.5” (about 29 rows). Switch to “Cream” color and continue for 7 more rows. Cont in pattern for 4 more rows; fasten off, leaving a 12-15” tail. Fold rectangle in half. The RS and the WS are essentially the same, so just press the sides together that look the prettiest to you. Thread tapestry needle using the tail of the last cream-colored row. Seam the cream section of the bag with a mattress stitch, being sure to keep the tension even so that your bag doesn’t have any holes or puckers. Err on the side of more, smaller stitches to make your seam more secure. When you reach the clay-colored section, weave in the cream yarn and seam the rest of the bag side and bottom with clay yarn; fasten off and weave in ends. Turn bag right side out. Add inside pocket out of fabric or crocheted swatch if you’d like. 1. Measure 36” of rope. 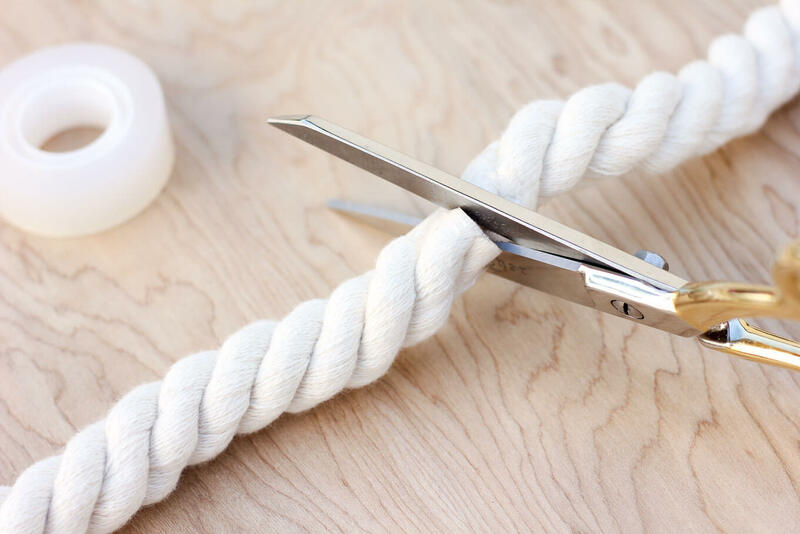 Wrap a piece of tape tightly around the rope where you plan to cut it. Then cut down the middle of the tape, leaving both freshly cut ends of rope wrapped in tape. Repeat to create a second 34” handle. Don’t remove the tape because your rope will immediately begin to unravel. 2. From the inside of the bag out, thread rope through handle holes and place a washer on each end of the rope. 3. Tie a tight knot in the rope at the very end of each handle. Repeat for the second side. 4. Apply Fray Check to the end of each rope before removing tape. Alternatively, gently remove tape and tie a piece of thread tightly around each rope end to prevent fraying. Hit the beach, the farmer’s market or your lunch hour feeling awesome because you made something useful and beautiful with your own two hands! That bag turned out great. I will have to start a new project after I finish the 15 pairs of slippers people have requested! If there’s enough interest, I’ll create a printable version that you can download for $2.50. In the meantime, you really only need to know the beginning of the pattern to get started because then you just do the same thing for quite a while. Perhaps you can just start in front of the computer and then move somewhere more comfortable. 🙂 I’m also publishing a video of how to do this stitch in the next day or two. Stay tuned! 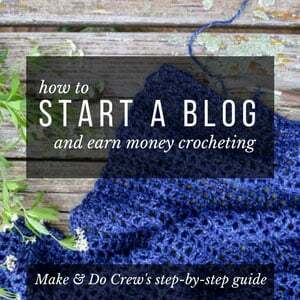 I haven’t crocheted in years and can’t go out slot. Are these easy enough for not new beginner but haven’t done in years? I think so, Robin! Especially if you watch my Suzette stitch video tutorial. Feel free to reach out with any questions. Haha, I know, Mom. Word sure gets out when you have a new slipper-making skill. May I ask what size this bag ends up being? I don’t recall seeing it posted. Thank you in advance. Can’t wait to give this a try. 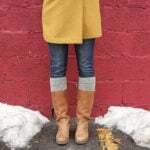 I love the stitch pattern and colors and the grommets are brilliant! Yay, Mandy! I hope you enjoy the pattern. I loved using this yarn. I feels great in your hands. How do you do a double crochet. I am a real beginner as I am left handed and no one could teach me. The I paid for lessons and the teacher told me to look in a mirror not at her hands. But no one ever showed me a double stitch. Lizzie you need to check out the site New Stitch a Day. He gives stitch instructions for both left and right handers learn all my stitches From his site. COULD YOU OFFER PDF PATTERNS, IT’S HARD TO TAKE THE PATTERN ON THE GO, USING TO MUCH PAPER. LOVE YOUR DESIGNS . Yes! I hear you 🙂 I create pdf patterns for some of my designs and sell them for a small fee. I didn’t make one for this post yet. I totally understand why it’s nice to have a paper version though. I hope to have more pdfs available soon. I’m struggling with the first row. I’m not comfortable with the FSC, so I chained 81 and then proceeded with the row one instructions. It says to do a Sc and Dc in the second chain from the hook (which places it in the 80th chain). I then followed the pattern across, which placed all the SC and Dc in the even numbered chains, and the skipped stitches as the odd numbered chains. Here is where I ran into a problem| I completed the SC and DC in the fourth chain from the end, and then I wasn’t sure what to do. The instructions say to have a skipped stitch and a SC I the last two chains, but that would mean I would have a skipped stitch side by side I. The third and second chain from the hook. Hope this makes sense! Can you help me? I love this bag! I think you might have found a mistake in the pattern! Thanks so much for your careful reading. I just went back and swatched it again and here is what should happen, I think: work just as you were until the last stitch (so right before the last stitch you’ll have done a sc and dc in the second to last stitch). In the last stitch, you’ll do 1 sc. Then you’ll proceed with row 2 and continue to repeat row 2 for the entirety of the bag. Thanks so much for catching that. I edited it in the pattern above. Would you mind letting me know if that works for you so I can be sure we’ve got it right now? Thanks so much for the quick reply, Jess. I’ll let you know how it goes! I finally had time to finish my bag, and I love it! Now my daughter wants one. ? Thanks do much for sharing your patterns. I love your style! Hey for the rope is it 3/4 inch wide? I just finished making my bag and it’s awesome!! It was easy, and unlike a lot of patterns, it turned out just like the photos. I’m going to make more in different colors – I love this yarn also!! Jane! What awesome feedback! I’m so happy to hear you’ve already got a new bag–and more to come 🙂 Isn’t that yarn great? I’m already thinking of other things I can make with it. I just like it so much! That bag is beautiful! I love the rope handles. Jess, can you tell me please the stichs number for the initial chain? I´m not capable to see this information in the instructions, sorry. This is just gorgeous, Jess! I LOVE the rope handles! Thank you for the wonderful creations. 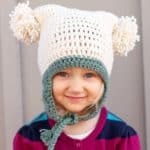 I am an .intermediate crocheter almost expert level but I love any type of pattern. I bet I could learn a thing or two from you, Mary! I wouldn’t call myself expert level by any means, but I really do have fun sharing beginner/intermediate tutorials with people who enjoy crochet. I love this pattern stitch &:will be making it soon. I bought yarn today and the colors you used were Clay and Cream. When I found the yarn in those colors it is a brownish beige color for Clay and a beige color for the Cream not gray and white as shown in your photos. 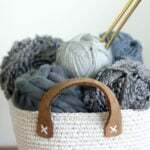 I was wondering if the yarn comes in a gray color and a white color but have different names than Clay and Cream ? Thank you. Looking forward to making this bag . Great question. I think it might just be a matter of how the photos look on your individual screen vs real life. I did indeed use cream and clay for the bag. I’m pretty sure Bernat doesn’t make a bright white in this line of yarn yet. Either way, I find this yarn wonderful to work with–I really hope you do too! Share a pic when you finish your bag if you’d like. I’d love to see it! I’m sorry for emailing another question but maybe my first one never went through but I’m wondering if a size J-10 us is 6mm ? Thank you. Yes it is! I always find this list helpful when I’m trying to translate hook numbers and letters. Thank you so much for your quick replies. I appreciate it. The yarn is very nice to work with. I’m having some problem when I’m starting to mark the stitches required for the handles as stated in the pattern. I understand how to make the spaces for the handles but when I measure the 6th, 32nd, 48th & 72nd stitch it isn’t the same amount of stitches from the sides . One marker is 6 stitches in from the side but the other side is 8 stitches in. Is this right ? You’re right that there’s 81 stitches across. Ideally, the number would be even, but since stitch requires an odd number of stitches, I had to use 81. I think the extra stitch on one side is negligible though. Now, for the handles, each handle hole should take up 3 stitches and the handle on the right side of your rectangle should begin 6 stitches in and then the handle on the left side of the rectangle should end with 6 stitches left to do in that row. (begin hole at stitch 72 + 3 stitches across = 75 stitches in, then 81-75=6) Hope that makes sense! Please let me know if not! Thank you so much. Yes it’s working for me & your answer made sense ! I can’t thank you enough for your replies. The washers should be on the outside of the bag, sandwiched between the knot and the bag. 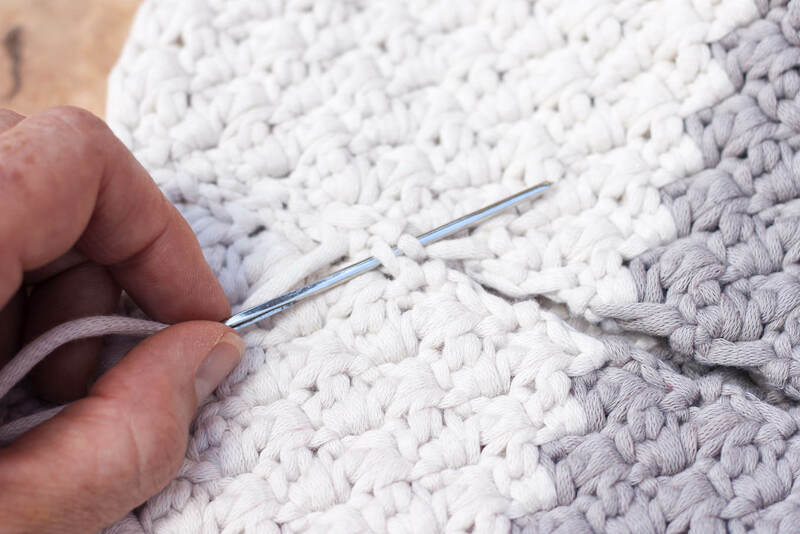 If they’re in this position, they shouldn’t be able to slide around, but they will give support so that the knot doesn’t pull through your crocheted holes. Does that make sense? If my piece does not lay flat should I block it? Also how would I sew a lining to the inside? Yes, I think blocking it could be a good idea. 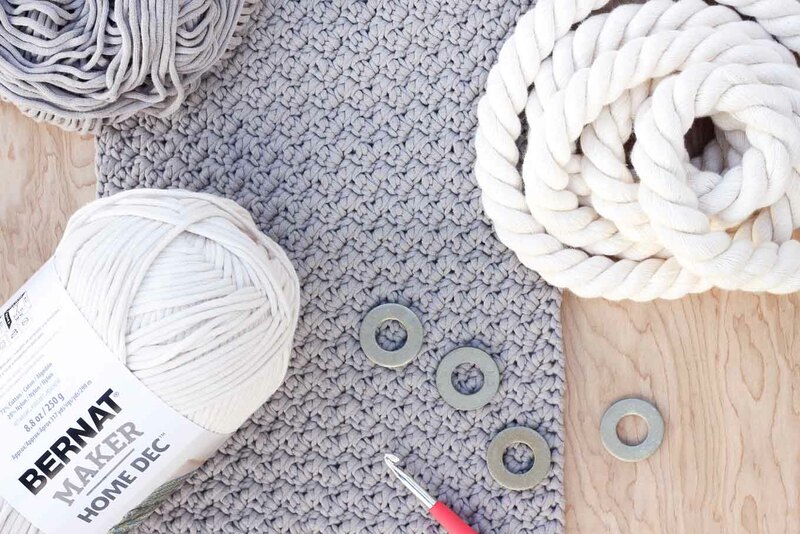 Did you use the Bernat Home Maker Dec yarn? It’s part cotton, so blocking could have a good effect. For a lining, I think you could potentially just sew a rectangle pouch that is slightly smaller than the rectangle of your bag. I’d probably just iron the top edge of the fabric pouch back to create a clean hem and then insert the fabric pouch into the crocheted bag with the nice side of the sewn seam facing toward the inside of the bag. Then I’d hand sew (probably using a whip stitch) the fabric pouch to the crocheted part of the bag. Does that make any sense at all? 🙂 Feel free to ask more questions if not! Love the pattern, was going to give it a try but have a question for you. Would you happen to know what size the rope is and what it’s made of or anything? I was guessing cotton and around an 1″ thick? I think I’m going to have to order this item online and since I won’t get to see it first I was hoping you could help me make sure I order something similar in size! Or did it come in packaging? Bummer about no Joann’s nearby! Do you have a Michael’s? This yarn is called “Bernat Maker Home Dec” and it’s sold there as well. You can also buy it on Amazon, Craftsy or from Michael’s online. (Affiliate links) If you look in the “supplies” section of this post, you’ll see a few more details about the colors I used. Thanks! I actually meant the rope you used for the handles. Home decor rope didn’t come up with much when searching. And didn’t have much luck at home improvement shops. I found something on Etsy I’m going to try out. Hi there! Love this pattern! I had a question though I made my bag with a chain of 101 to start and I’m having a hard time trying to figure out where to place the stitch markers for where the straps would go through? Any help would be appreciated! And thank you for all your wonderful patterns! Is it possible to crochet this Suzette bag in the round? Great question. I haven’t worked the Suzette stitch in the round, but I have heard from someone else that they did and it worked fine. Perhaps check out my Suzette stitch tutorial post for any multiples you’d need to know and then make a super mini version in the round just to see if it’s looking how you’d like it to after a few rows. I’d love if you’d report back! I’m sure others are wondering the same thing. Love this bag! I’m going to attempt to make it while I’m on bedrest and waiting for baby to arrive. Because I can’t leave the house, I’m ordering everything online. Could you measure the diameter of the rope handles, so I know which rope to buy? it’s hard to tell on the screen how thick they are. I’m sorry for the delay in getting back to you. The rope is about .75″ wide. Best of luck waiting for that sweet babe! I’ve frogged this bag twice now and am so confused. I’ve only gotten about four rows in each time and go back to either the video or the written instructions and come away with different ideas of how this stitch is supposed to look. Do you place the new stitch in the V or the outside of the V from the previous row? 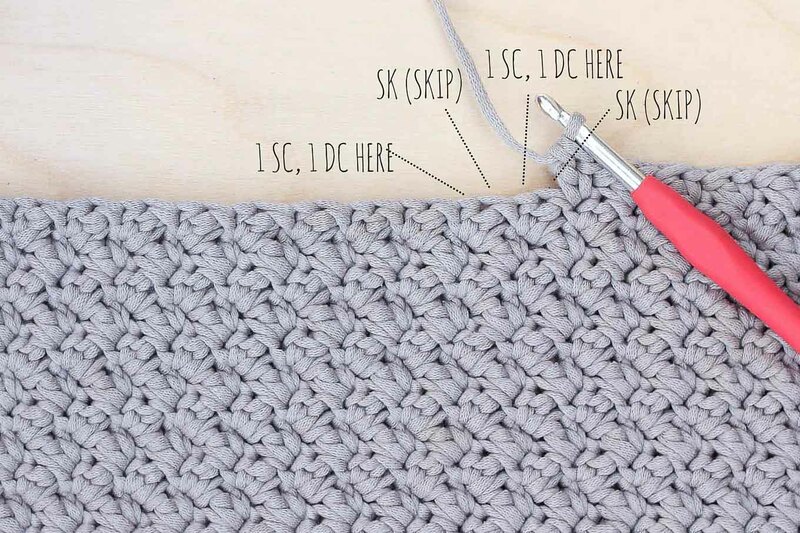 In the video it looks like you’re placing the stitch in the gap between stitches, whereas in the provided picture it appears that you’re placing the stitch smack dab in the middle of the SC + DC. I’m sure I’m making this harder than it needs to be! I love the idea of this bag, but I have to say that the yarn is almost too stretchy to hold the shape of the bag. I expected it to be more firm, so after making the bag I made a liner of canvas to go with it.. On the rope, I also have to comment that Joann’s doesn’t always have it in stock, so I looked at the stated hickness (about 3/4″ was what Joann’s site said) and I ordered some on Amazon. I think it was probably bigger than Joann’s. When I cut the rope, 34″ was definitely not long enough, and the handles look far too thick and short for the bag. I would post photos of the finished bag, but I can’t do it here. I think lining the bag is a great idea. I recently did that on my boho bag and I really like how it make the bag sturdier. Regarding the rope, I wonder if the slightly thicker rope used more length to be tied into knots? Either way, I appreciate the feedback and will increase the yardage in the pattern a bit so that people are sure to have enough. How do the washers stay on? Are we supposed to somehow crochet around them to secure them? The washers stay on just because of the knot that’s tied in the rope handle. The total circumference of the washer is big enough to not pull through the hole in your crocheted bag. How do the grommets stay attached? Do we crochet them into the holes somehow? Grommets are hammered together and they sort of pinch the fabric that they’re near, so in that way, you’re connecting them to the holes by kind of snapping them in. The washers work great though if you’re just looking for a way to reinforce the hole where the handle goes. Also, I recently lined my Boho Bag, and it has worked great. If you plan on carrying heavy loads, I think a liner can be really helpful. Thank you for the pattern! The bag is really beautiful. I’m just crocheting it and I found a mistake in the pattern: In the 2nd row you wrote to finish the row with 1 sc in the turning chaine. I think it’s a mistake and should finish the row with 1 sc in the last sc of the previous row. Thanks so much for checking in, Helga. I’m always happy to know about potential errors. 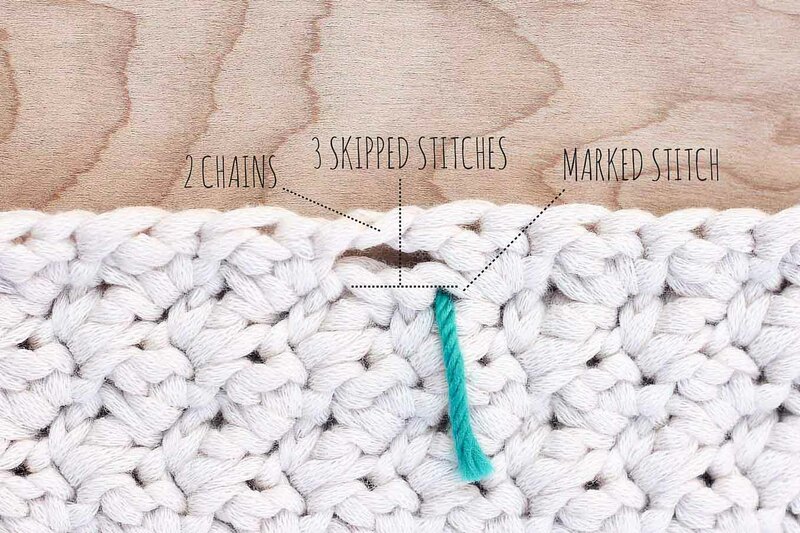 In this case, I think the pattern reads correctly and you should put that final sc into the turning chain to make the edge of the rectangle better resemble the stitches in the rest of the row. Could I use other yarn to make this bag? What would you recommend? Love your patterns!! Have a question on this one, I went ahead and made it with 101 stitches but can’t seem to be able to figure out where to place my stitch markers since I have 20 more stitches then your tote?? Also what is the length of the belt you used for your updated pattern of this tote?? I am thinking about starting this bag, but I was wondering if this bag is washable/dryable in a washing machine/dryer? I’d like to be able to wash it and dry it and not worry about it coming apart. It’s ok if it shrinks. Let me know what you think. I think you’d be fine washing the yarn, but you could look at Home Dec yarn’s care instructions to be certain. I think where you might have an issue is washing the rope without the tail end getting a little muffled up. If you’re willing to hang it dry, I bet you could make it work though. Hope that’s helpful! Thanks so much for this pattern! I see some of your other patterns use the Lion Brand Fast Track, do you think that would work with this pattern? I have started this bag. Looks great. I was wondering if you had any instructions on how it could be lined with fabric?